Over the last few years my frizzy hair problem seems to have grown, especially in the warmer humid months. I’m really not sure if it’s age related or if it’s simply more humid lately, but either way it needed to be dealt with. Some flat iron’s were not working for me in the way I had hoped. I was looking for a straightener that could quickly smooth and straighten my hair without too much noticeable damage, because I intended on using it frequently. I finally found the HSI Professional Ceramic Tourmaline Ionic Flat Iron with thermal protector. In this review, I’ll tell you all about the features and benefits of this great little device that has saved me from stepping out that door with a head of frizz! No automatic shut-off. If you are forgetful, you may want to consider another hair straightener that has this function. Some customers complain of heat loss during use. HSI Professional, a company out of Florida, provides consumers with salon quality styling tools that have been stress-tested under extreme circumstances for use at home all over the world. 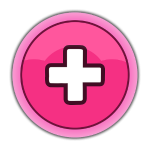 They continue to expand their product line and have made a promise to provide these high quality products with the fastest shipping and best customer service. A promise that we consumers like to hear. They are also involved in events and charities which is important to me as a consumer with a conscience. Now let’s get to the features of the HSI Professional 1st generation flat iron. 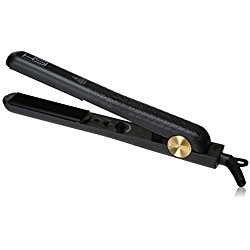 The 1″ plates on the HSI Pro flat iron are made of solid ceramic tourmaline that use advanced infrared heat technology. Ceramic tourmaline ion plates heat up quickly and result in shiny, silky hair. The 1″ plate is suitable for all hair types and lengths so if you are looking to purchase a flat iron as a gift for someone special, there is no need to worry about figuring out their exact hair type if you choose this device. 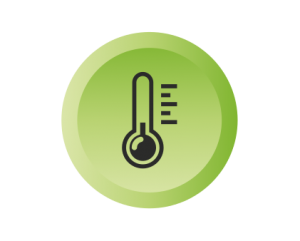 The adjustable temperature control ranges from 240F to 400F (120C – 200C) which is once again suitable for all hair types due to the high range. This flat iron features a 360 degree swivel cord making it easier to use as you make your way around your whole head. Worldwide dual voltage. There is no need to manually switch the voltage as this device will automatically convert to the proper voltage on it’s own. 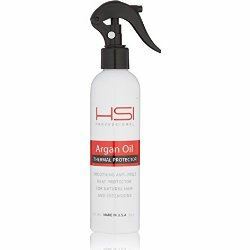 An added bonus if you purchase the HSI hair straightener, is the glove, pouch and travel-size argan oil leave-in hair treatment that comes with it. The pouch is a convenient way to store the flat iron if you are travelling or to keep it free from dust in your bathroom drawer. The argan oil naturally has smoothing and heat protecting effects. 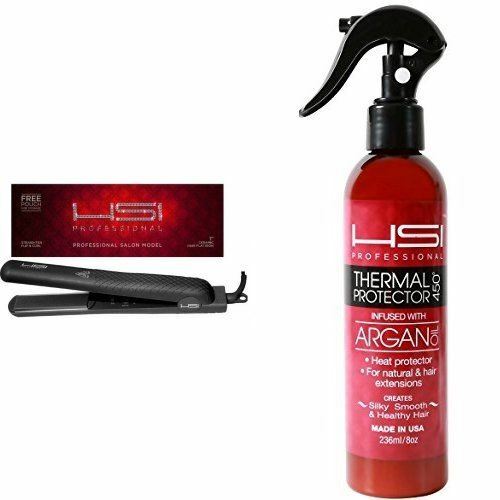 As if that wasn’t enough, it also comes with HSI Professional thermal protector spray that is made in the USA! It is meant to be used before flat ironing to help protect hair from the heat of the hair tool and as someone with fine hair that breaks easy, this is a must for me. It helps to hydrate the hair as well as protect and is infused with vitamins a, b, c and d.
All of HSI’s products come with a 1 year warranty. Always allow the device to cool before cleaning and make sure it is unplugged. Clean the barrel with a soft, moist cloth. Make sure to not get the handle wet.